Eat. Breathe. Sleep. Phillies Baseball. marathon on ESPN Classic….you won’t regret it. magical ride last October. So, thank you, Pat. obvious it is he never attended or fell asleep during media training classes. come out of the box and start the season with 10 homers in April. million deal – the same deal that was offered to him in November – on April 4th. 21 more until Opening Day at Citizens Bank! Yesterday had the potential to be a terrific day. I woke up at 10 a.m.
on a Sunday to get front row seats in hopes of getting on an ESPNU telecast. television was no consolation – I would have traded it for a W in a heartbeat. But baseball cures everything, so let’s blog rapid fire style. Team USA’s World Baseball Classic roster, replacing Cleveland’s Grady Sizemore. in the clubhouse is a boost that won’t show up in any newspaper’s box score. dive into the shallow left field seats. Eagles front office management never pays for aging veterans. to a three-year/$24 million deal was an exception. of transgressions surely fueled the pressure on him to resign. 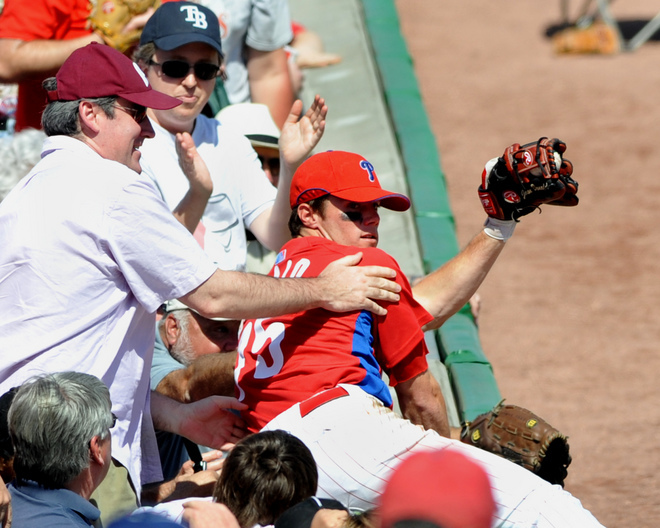 Have a phantastic Phillies day! A Yearlong Journey: How did we get here? Yes, James Harrison, Champions Visit the White House and Meet the President. It’s Tradition. Nearly No-hit by Dave Bush?!? !